If you are looking for information on accredited schools authorized by the Hawaii Post-Secondary Education Authorization Program (HPEAP), please see the HPEAP website. 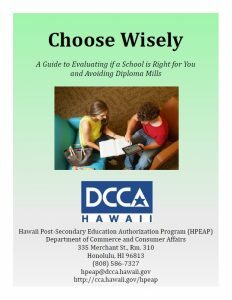 For those considering continuing their education at an unaccredited school, you may want to download HPEAP’s “Choose Wisely” guide. In the State of Hawaii, degree granting institutions fall into one of two categories: accredited or unaccredited. State law specifically defines an unaccredited institution as a “degree granting institution that is not accredited or a candidate for accreditation by at least one nationally recognized accrediting agency that is listed by the United States Secretary of Education.” Not all so-called accrediting agencies enjoy such recognition. The U.S. Department of Education’s Office of Post-Secondary Education provides a list of recognized accreditors and accredited institutions and information on accreditation online. The Western Association of Schools and Colleges is the recognized regional accrediting association that accredits private schools, colleges and universities in the State of Hawaii. They provide a listing of the WASC institutions operating in or from Hawaii. Private trade, vocational and technical schools are required to be licensed and are regulated by the State of Hawaii’s Department of Education (“HIDOE”). For further information on these types of schools, contact the HIDOE at ptvt@hawaiidoe.k12.hi.us or go to the HIDOE website on licensed vocational schools. Unaccredited degree granting institutions which offer courses, programs, or degrees, or maintain a campus or an administrative, corporate, or other address in Hawaii are subject to Hawaii’s Unaccredited Degree Granting Institutions law, codified in Chapter 446E of the Hawaii Revised Statutes. The Office of Consumer Protection is the state agency responsible for enforcing Chapter 446E. Unlike many other states, Hawaii does not accredit, license or approve any unaccredited institutions. §446E-1 defines various terms used within the law. §446E-1.6 lists the types of schools and courses of instruction that are not subject to the law. §446E-2(a) and (b) contain the requirement that unaccredited institutions must disclose their unaccredited status and the method for doing so. The section contains the exact text of the required disclosure and other information concerning it. §446E-2(c) requires unaccredited institutions to keep records and to produce them to the Office of Consumer Protection upon request. §446E-4 requires unaccredited institutions to designate and maintain an agent for service of process purposes and provides a mechanism for serving process upon them. §446E-5 contains a list of prohibited practices. Unaccredited institutions cannot indicate or suggest that the State licenses, approves, or regulates its operations. They cannot offer or issue juris doctor, master of law, doctorate of medicine or equivalent degrees. Unaccredited institutions are prohibited from issuing any degrees unless they have a Hawaii office, a Hawaii resident employee and 25 enrolled students in Hawaii. Unaccredited institutions are prohibited from accepting tuition or other payments unless they are in complete compliance with all the provisions of Chapter 446E. Unaccredited institutions are prohibited from claiming that they have applied for future accreditation. Violations of the provisions of Chapter 446E are deemed to be per se “unfair acts or practices.” Under Hawaii law, unfair acts or practices are subject to fines of not less than $500 nor more than $10,000 for each violation. The Office of Consumer Protection has filed numerous lawsuits seeking to enforce the law. A list of the universities which have been sued, including the text of the lawsuits and judgments is now available. Individual students or graduates also have the right under state law to file their own private lawsuits or class action suits against universities which they believe have violated Chapter 446E. In addition to Chapter 446E and like any private business, unaccredited degree granting institutions are also subject to the general business and consumer protection laws of the state.